John Wells’s phonetic blog: a cat that malts? As far as I know, malting is an activity performed only by brewers, distillers, and manufacturers of malted milk. So what kind of beverage is the cat in this cartoon preparing? 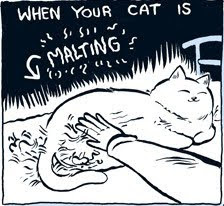 What the cat is doing, of course, is meant to be moulting (BrE) / molting (AmE): tiresomely shedding hair all over the carpet, the furniture, and people’s laps. This is an interesting spelling mistake, because it seems to imply that the cartoonist, Nick Edwards, pronounces malt and moult identically. If, like me, he pronounced malt mɔːlt, i.e. with the THOUGHT vowel, and moult məʊlt, with the GOAT vowel, he would be unlikely to confuse them in spelling. The same applies, if like many other British people, he pronounces malt as mɒlt, with the LOT vowel, just as long as it’s still distinct from moult. And the point still applies if, like many people, he has a noticeable pre-dark-l allophone for GOAT, so pronounces moult as something like mɒʊlt. Sorting out the possible mergers of vowels in the context of a following preconsonantal or final l is tricky. Even in London, let alone the rest of the southeast of England, there seems to be considerable variability. A trainman on Wimbledon station regularly announces trains as calling next at ˈeosfɪod Earlsfield, implying the existence of possible homophones such as well–whirl and fill–feel. One of the coaches at my running club, who would never do anything so vulgar as to drop an h, nevertheless momentarily confuses some of us by having hill and heel as homophones hɪo. This is by no means only a working-class phenomenon: I remember the eminent (and rather posh) phonetician Gillian Brown telling me she had several of these contextual mergers of the back vowels before l in her own speech. There is one group of southeasterners who, unlike most, merge LOT and GOAT in this environment, so that doll and dole are homophonous. Furthermore, rather over half of the English have LOT rather than THOUGHT in the set fault-malt-halt-salt (see LPD charts for salt). If the cartoonist belongs to both these groups, there is our explanation of confusion over the spelling of moult. The cartoonist is aware of the misspelling, and says he will change it eventually. Meanwhile, let me thank him for providing me with an apt example. I have the situation described in your last paragraph (LOT merged into GOAT before dark /l/, no THOUGHT in salt etc., so that malt and moult are the same) except that I'm not a south-easterner. John, I can offer you a similar - though less striking - example of the topic you're discussing today here: http://alex-ateachersthoughts.blogspot.com/2010/06/solstice.html. Sheffield, accent otherwise "near RP" in the AofE sense (e.g. trap-bath unsplit but foot-strut split). It's now 15.00 British Summer Time and the cartoon has already been altered to When your cat is shedding. Blogspot says that the page doesn't exist. I've found the cause of the problem. Your punctuation is too good! The full stop at the end of the sentence is a trap for the copy-and-paster. There must be several people who pronounce them the same way as you see them spelled the wrong way around. Google search even completes the phrase "malting dog" if you start to type it. David, thanks very much for your comments on my blog! As far as I can tell, they're pronounced the same here in Australia. Re Australia, I don't think that can be true. My Macquarie Dict. transcribes malt as mɔlt, mɒlt but moult as moʊlt. Professor Wells, I think many non-expert speakers—including me—who use the pre-dark-l allophone of the GOAT vowel have difficulty distinguishing between this vowel and the LOT vowel, even though they don’t merge the two phonetically. To non-experts, the pre-dark-l allophone of GOAT seems more like a variation of the LOT vowel than of the GOAT vowel; before I learned about phonetics, I was sure that, despite what the dictionary said, I used the LOT vowel in words such as “cold”. These days I still have to think very carefully to determine which sound I use in a given word. Furthermore, for me and others, I think the pre-dark-l allophone of the GOAT vowel can readily lose its second target in fairly rapid speech. Note that I don’t have l-vocalisation. I recall recently watching a TV show here in Australia in which an actor affecting an American accent made the mistake of using the LOT vowel instead of the GOAT vowel in a word like “told” or “fold” (I can’t remember the exact word). The error stuck out like a sore thumb, since the two sounds are very distinct in General American, but it does point to uncertainty about these sounds among Australian speakers. Thus I never seem to see anything 'baldly' stated these days. It always seems to be 'boldly' stated, even when that doesn't seem appropriate. That may be an unduly bold statement, but for the sake of argument I am quite happy to baldly go where no man has gone before, and baldly state that in the overall system of SBE the distinction is dead and buried, but perhaps not yet decomposed. Now that Anon has galvanized me into googling Google, I see it likewise tries to redirect searches with 'baldly' in such contexts to 'boldly', but more specific searches make it obvious that the merger is well established, at any rate in the UK, if one discounts the puns and the literate posters. I'm from Australia (Melbourne) and I pronounce malt and moult the same way (to rhyme with salt, bolt, fault, etc). I also pronounce doll and dole (as a noun) the same way. In the US many people have the BALD/BOLD merger. We're also working on a more detailed investigation into this at the moment. Regarding other prelateral vowels - I'm also from Melbourne and along with "salary"-"celery" I also pronounce "malt"-"moult" exactly the same way, but not "doll"-"dole".